Back in July, Universal Pictures Home Entertainment announced big plans for Back to The Future's 30th Anniversary celebration. All three Back to The Future movies are coming back to theaters for one night only on October 21, and a new Blu-ray & DVD trilogy set will debut on October 20. To get fans ready for this big even, the studio has released an official commercial for the iconic pink hoverboard used by Marty McFly (Michael J. Fox) in the 1989 sequel Back to the Future Part II. This video is just the latest to debut, in conjunction with this highly-anticipated event. Earlier this month, the studio released new commercials for Pepsi Perfect and Jaws 19. While we certainly won't be seeing Jaws 19 in theaters anytime soon, Pepsi will actually be selling Pepsi Perfect on October 21, although supplies will be limited, since only 6,500 bottles will be made, each outfitted in a special collectible case. The 16.9 oz. bottles will contain Pepsi Made with Real Sugar and will sell for $20.15. 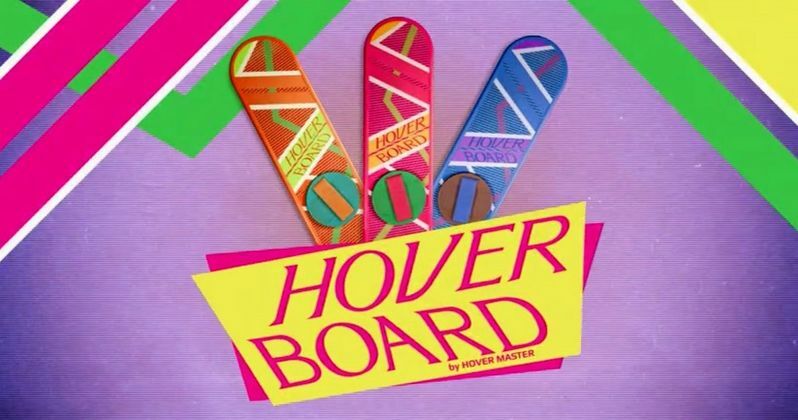 As for the hoverboard, it isn't known if any official replicas will be sold to fans, in conjunction with the Back to The Future 30th Anniversary, but there is an actual, working hoverboard out there. Back in June, Lexus unveiled their hoverboard prototype, which uses magnetic levitation to achieve amazing frictionless movement. The car company released a series of videos throughout the summer, showing how this hoverboard works, which they achieved by creating a custom skate park that had a metal surface under the concrete, to allow this hoverboard to work. Lexus has stated that this hoverboard will not be made available for purchase. In addition to the home entertainment release, the Back to the Future celebration continues in theaters when the films go back to the big screen on October 21, 2015. Check local listings for show times. Additionally, Universal Music Enterprises is reissuing an all-new 30th Anniversary picture disc vinyl soundtrack, available October 16th in stores and through all digital partners. While we wait for more details on this incredible Back to The Future event, check out the new hoverboard commercial below.